Oh Damme, sad news for this Saturday morning as prolific television producer and creator Glen Albert Larson has passed away. Former pop singer and Long Beach native Larson created, wrote and produced the likes of Battlestar Galactica, Magnum P.I., and The Six Million Dollar Man but I'll always know him as the guy that gave me Knight Rider as a kid and then Night Man as a teenager. Knight Rider of course, gave the world David Hasselhoff in a modern retelling of The Lone Ranger as a former cop, thought killed on the job is rescued, given a new face, identity and purpose working for the Foundation of Law and Government as Michael Knight to take on criminals working above the law. Oh yeah and instead of a horse he has a souped up, nearly invincible Trans Am that can drive through walls, turbo boost over danger and talk called the Knight Industries Two Thousand or K.I.T.T. for short, voiced by William Daniels. Appearing on NBC in 1982, Knight Rider was part of then wonder-kid Brandon Tartikoff's rebranding of the low rated network that would go on to become a powerhouse with popular and influential shows like Knight, Miami Vice, The Cosby Show, Wings and The A-Team. Just being born, I missed all the hoopla of Knight Rider's original four season run and picked it up as a youngster on USA Network reruns after school. From the unforgettable theme song to the breathy voiceover, I loved the weekly adventures in a new town where usually clad in a tight polo, tight black leather jacket and tight jeans Michael would be dispatched by his boss Devon Miles (Edward Mulhare) to investigate shady dealings where common folk were being squeezed and threatened by thugs of all sorts from car thieves to circus gangsters to robbers to professional athletes. And mack on chicks, of course. K.I.T.T. 's high tech, "Darth Vader's bathroom" upgrades allowed him to see through walls, jam radio signals, analyze samples and even print from the dashboard. Michael and K.I.T.T. had a nice rapport as the former would teach the latter about sports and women while conversely, K.I.T.T. acted as the voice of reason to Micheal's hot headed tendencies. When Michael had to get out of the car, they stayed in touch with a radio wristwatch and Michael would call K.I.T.T. for help many a time. Now we have self driving cars and smart watches so looks like reality is catching up to Hollywood. While the car might have been the shiny object, Hasselhoff's easygoing charm and awkward, lanky, karate style antics were just as important. But what a shiny object, the 1982 Trans Am sports model would become a pop culture symbol for the decade and beyond. So much that manufacturer Pontiac asked that they not be mentioned as demand skyrocketed. 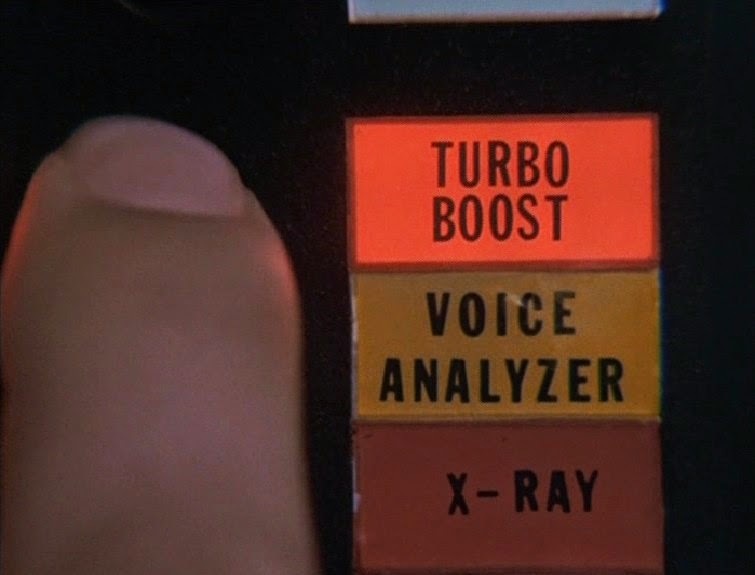 Given a sleek shiny black paint job, a pulsing red light in front along with a high pitched whistling while driving, K.I.T.T. was the future. Tricked out with gadgets like ejector seats, smoke spray, grappling hooks, even a flamethrower! Then of course no episode was complete without some car stunts a la rubber track leaving 180's in the middle of the street, driving up on two wheels and Turbo Boosting over every thing like other cars, ponds and walls. In one episode, K.I.T.T. drove on water! To this day, a replica would be my dream car. During Knight Rider's 4 year run, Larson had two additional programs on television, juggernaut Magnum P.I. and The Fall Guy. 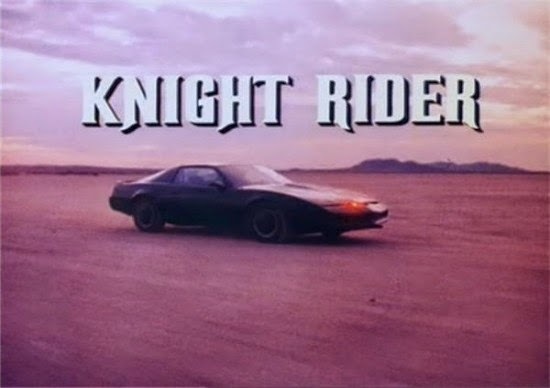 After KR wrapped up in 1986, 1991's not very good television movie Knight Rider 2000 failed to relaunch the series and 1997's Team Knight Rider lasted one season. In 2008, NBC was in the midst of another ratings plummet and began tombing past properties to relaunch. 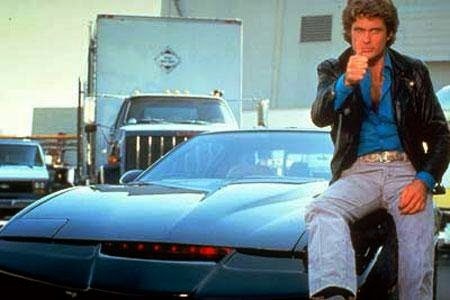 Knight Rider became a two hour back door pilot and cruised 17 episodes before running out of gas. Hasselhoff appeared as Michael Knight and his estranged son was the focus of the new series. K.I.T.T. had been upgraded to a clumsy and not very cool looking Ford Mustang voiced by Val Kilmer. A feature film adaptation has long been in the works but has yet to gain traction. The Hoff of course would go on to have a very colorful career, appearing on world wide hit show Baywatch for 236 episodes, achieving some minor hits as a pop singer and even play Nick Fury years before Samuel L. Jackson would don the eye patch in a decent T.V. flick. Larson would hit a little bit of a dry spell before an early 2000's resurgence with Battlestar Galactica. 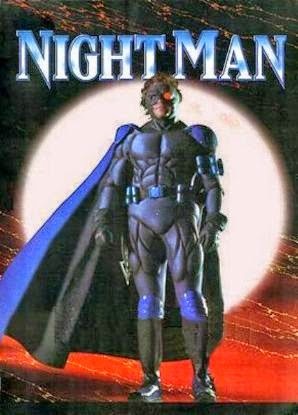 In the 90's, Larson was only involved with one show that lasted more than a season, the syndicated comic book adaptation, Night Man. Based on the Malibu Comics character, Night Man the show was like Batman meets a little bit of Daredevil as police academy level martial arts instructor turned saxophone player Johnny Domino is struck by lightning and gains the ability to tune into the frequency of evil. You know, like sense someone is gonna shoot somebody, planting a bomb or trips a trap that unleashes a tarantula? Using his karate skills and some top secret, high tech combat gear like an anti-gravity belt, stealth cape, bullet-proof suit and a totally 90's mask with exposed hair, he takes to the skies and streets to battle crooks big time and small. While cheaply produced, Night Man was a fun show I watched on WGN as a young teenager. The Protector's Matt McColm plays Domino/Night Man with his likeable stunt guy demeanor and action figure handsome physicality, looking cool in San Francisco in tee shirts and vests while driving his purple Prowler. Earl Holliman (Gunfight at the O.K. Corral, Forbidden Planet, Sons of Katie Elder) shows up as Johnny's former cop dad while a tech sidekick and police detective were also regular supporting players. Being the 90's, action was pretty practical with car chases, fisticuffs, explosions and broken windows while random green screen scenes show Night Man "flying" stiffly around town in his black and blue suit complete with a bright red, laser beam firing eye. The Knight Rider himself David Hasselhoff appears in a brief cameo in part 2 of the pilot as a suave, evil arms dealer type who gets offed by Night Man who then drops a quip about "life being a hassle"! (Stands up and starts the slow clap) Bravo, writer and executive producer Larson, bravo. 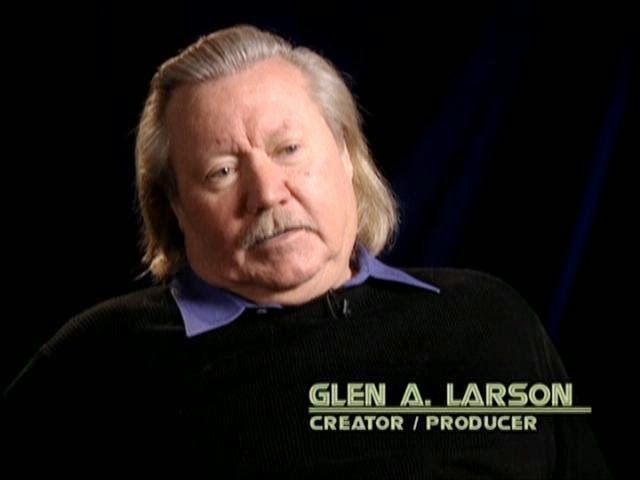 Thanks for the hours of fun and entertainment, Mr. Glen A. Larson. View in Peace!